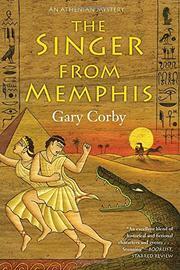 I get a kick out of Australian author Gary Corby's wicked sense of humor -- but I should admit right away that THE SINGER FROM MEMPHIS is not an Elvis Presley mystery! Opening in ancient Athens like Corby's preceding five Athenian mysteries, it features Nicolaos, the only private investigator in his city-state at the time. And, of course, his highly intelligent and (gulp) philosophical wife Diotima, who's already broadened his views of women, life, and theatre in preceding titles. Somehow Herodotus knew that Diotima and I had been to Ionia, a province of Asia Minor ... it seemed odd to me that he knew such a detail. Herodotus proceeded to ask us questions about Themistocles. We were able to fend off almost every sensitive issue, since we had only met Themistocles at the end of his life. "How did he die?" Herodotus asked. He held the brush poised over his scroll and looked up at us expectantly. I said, "He died of an illness. It was natural causes." The explanation might have held, except that at the very same instant Diotima said, "It was suicide. He drank bull's blood." Herodotus looked from one to the other of us in surprise. "Surely it must be one or the other." "It was both," I answered, thinking quickly. "When Themistocles learned he was dying of natural causes, he drank bull's blood to end it all." "I see," Herodotus said doubtfully. "I didn't realize bull's blood was poisonous." "Oh, it is," Diotima said with a straight face. "I thought everyone knew that." "Thank you," Herodotus said. He scribbled notes. After that we resolved to avoid Herodotus whenever he had his scroll open. The pen (or ink brush) may be mightier than the sword, but it's a crossbow that Nicolaos will soon fear, along with spears, crocodiles, and more. Among the forces fighting for Egypt's throne are a cabal of Public Service workers determined to protect their cushy jobs and incomes, at least two potential rulers, and the massive power of the Persians and the Spartans. Sure, I had to have my arm twisted to start reading this series (revealed in an earlier review here), but Gary Corby's dialogue and plot twists are so entertaining that it's easy to put aside skepticism about "history this old" and relax in the grins and laughter that THE SINGER FROM MEMPHIS provides. Capers, politics, good old-fashioned murder and other crimes -- it's all here, like a happy bundle of papyrus fastened with a scarab or two. Great summer reading, so add it to the stack! And yes, this is another winner from Soho Crime ... gotta love that press for lively international mysteries in all centuries, continents, and flavors. The first book in the Ruth Galloway crime fiction series, The Crossing Places, won the Mary Higgins Clark award for 2011 -- and of course, the award took place some time after the book hit the stores. 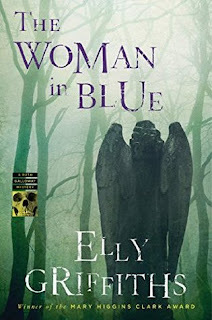 Now in 2016, author Elly Griffiths presents the eighth in the impressive sequence: THE WOMAN IN BLUE. This series features forensic anthropologist Ruth Galloway, a professional at university level who still has to fight for her career, against the sexist and crass assumptions of people like her boss. Single parenting in a community that's gradually becoming aware of her daughter's father -- married and unavailable -- Ruth juggles child care and teaching and investigation, in a jumble that feels all too familiar for modern life: nothing's easy, there's never enough time, and all of it matters intensely. 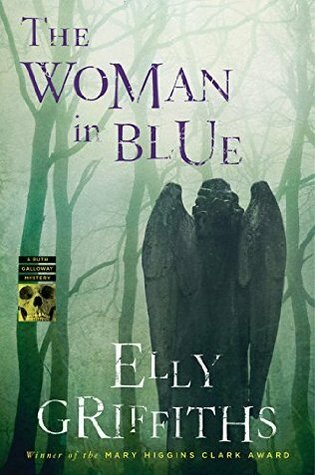 As THE WOMAN IN BLUE opens, one of the most appealing of Ruth's friends, Cathbad, himself a parent and also a modern-day British druid, witnesses a "woman in blue" (how can I not think of T. S. Eliot's vision in blue, "in Mary's color") standing in an ancient Christian cemetery. "As Cathbad approaches, she looks at him, and her face, illuminated by something stronger than natural light, seems at once so beautiful and sad that Cathbad crosses himself. 'Can I help you?' he calls. His voice echoes against stone and darkness." It's understandable that Cathbad wonders whether he's seen a real person, or a vision, even if that would belong to a faith very different from his own. But as Detective Chief Inspector Harry Nelson quickly discovers, along with the young woman's corpse, she's been a patient at an upscale drug rehab facility nearby. The blue "cloak" is a dressing gown, even if it does look -- to Nelson's usually unimaginative eye -- like a druid's down attire. Ruth Galloway quickly becomes part of the investigation: partly because Nelson and his team count on her for her expertise (although usually for Iron Age skeletons! ), and mostly because an old friend from archaeology school is in town for a conference of woman Anglican priests heading toward higher positions in the church hierarchy. When Hilary Smithson reconnects with Ruth, there's a powerful ulterior motive for getting back in touch: threats against her life, which Hilary hopes that Ruth can help assess, based on all the modern-day police connections that Ruth's clearly experienced in the past few (very public) years. "The thing is," says Hilary again, cubing the cubes, "there are some people who just don't like the idea of woman priests." Ruth knows. She's read about it in the Guardian. Though, to be honest, she usually skips those articles on the way to the TV listings. "Most women priests get abuse of some kind, people saying things, refusing to come to their services. When I first started getting the letters I didn't think anything of it. A rite of passage ... Then, at the end of last year, the tone seemed to change, to become nastier, more sinister. But what worried me most were the references to archaeology ... because it was specific to me. ... He must have found out that I was coming to this conference." Ruth's dubious about her ability to help -- but soon the twists of events threaten her carefully balanced life, including her relationship with her daughter's father, and when her own slant on the past comes into play (archaeology matters! ), she moves several steps ahead of the police in grasping the motive for the spate of deaths of blond young women like the one "in blue." But then again, that would get in the way of writing Ruth Galloway investigation number 9 -- and I want more of these, for a very satisfying shelf of mysteries that I re-read with pleasure. Now that I think of it, maybe that's how I'll celebrate the start of official summer in a few weeks: by returning to the start of the series and reading them all again. Yes! 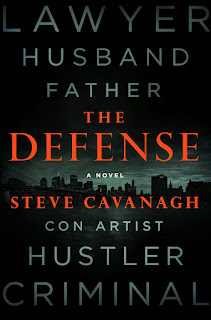 Steve Cavanagh's debut crime novel is a legal thriller set in New York City, mostly at the Manhattan courthouse on Chambers Street. It's a page-turner, at a wild pace, and full of twists, suspense, exhilaration, and highly satisfying conclusions. 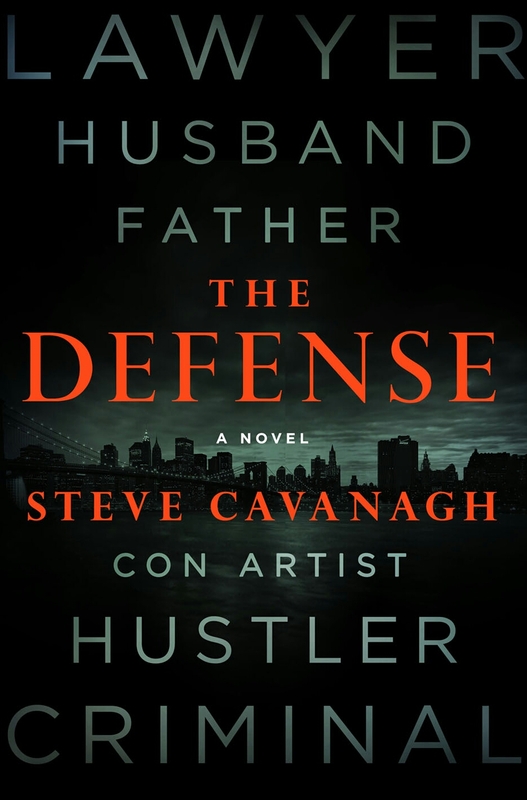 I would never have guessed THE DEFENSE was a debut -- but then again, Cavanagh has been writing for years ... as a lawyer in Belfast, Ireland. It's not all that unusual for a British author to place a crime novel in the United States. And some authors seem to switch-hit on both sides of the Atlantic -- consider John Connelly, Irish but setting his Charlie Parker detective series in Maine. Then think about Adrian McKinty, another Belfast author who's also lived in Australia and the US. As it happens, Cavanaugh's first US debut, for a short story, came in the collection Belfast Noir, co-edited by McKinty and another extraordinary Belfast author, Stuart Neville. All of which are great signs for what Cavanagh can produce, given the company he keeps! But if I hadn't checked on him, I never would have guessed Irish from reading the adept switches among New York urban dialects and the language of the Russian mob in THE DEFENSE. Here's the premise: Eddie Flynn used to be a con man, but a situation changed his direction to law school and he practiced law for nine years. As THE DEFENSE opens, that hasn't been an option for months now -- some kind of disaster in one of his cases gave him a shove into deep alcoholic self-pity, his marriage is on the rocks, his 10-year-old daughter can't see him much, and he's definitely not going back to court as an attorney. Except: Suddenly the Russian mob has him wired into a jacket of explosives and is demanding his performance at the courthouse -- starting now! -- and to make sure Eddie won't just yield to his king-size case of despair and opt for suicide by Russian mobster, they've kidnapped his daughter. Eddie's life has been is a roller coaster of strengths and mistakes. But it happens he does know how to handle having psychopathic mobsters as criminal defense clients. Good thing, because he needs to be at the top of his game almost instantly, against a clever and well-prepared prosecutor, for the life of his little girl. "Is Mom there with you? Can I ... please ... I want to talk to her. I want you ... I want you and Mom to come get me, please. I love you. Please come get me, Daddy ... please ..." She broke down completely, each shrill cry bringing her closer to hysterics. Her sobs grew fainter as the phone was taken from her. What would you do under that level of threat? Yep. So will Eddie. And it looks like an impossible task, but after all those years, Eddie does have a few friends, and at least one of them is in the same courthouse. A top-notch thriller with relentless suspense and highly memorable! And although the finale put a bit of a dent in my own recent memories of that same courthouse, I have to admit it's a good fit. I'm looking forward to more from Steve Cavanagh ... and I see his next crime novel, The Plea, is scheduled for next March. Nice to have Flatiron Books (linked to Orion and Macmillan) bringing these across the "pond." Charles Todd, Jacqueline Winspear, James Benn -- if you're already reading any of these authors whose mysteries depend on the actual history of the two World Wars of Europe and beyond, Barbara Cleverly's books belong on your reading table, too. Her first in the Joe Sandilands series, The Last Kashmiri Rose, came out in 2001 and grounded her character and "England" in the realities of Britain's failure as a colonial power. Sandilands begins to deepen as England's release of India means his own upcoming departure of the colony-turned-independent-nation, although it took until the ninth book of the series, The Blood Royal, for Joe Sandilands to embrace a leadership role in the Metropolitan Police. Joe's not quite at the top of that force, but close enough to meet from time to time with the nation's political leaders. Personal losses deepened this character further, and it began to look as though he'd grow sadly alone in maturity -- but in book 12, Enter Pale Death, his competition with another man for the hand of a rural doctor seemed finally to bring him some happiness. With that doctor, Adelaide Hartest, the new Sandilands investigaton (#13) opens in DIANA'S ALTAR. At the end of disturbing night -- whose details we learn much later -- Adelaide has bicycled before dawn to a small church in Cambridge, where she hopes to sit, think, and perhaps pray, seeking a way forward from the fatigue and anger shaking her. "Why should I? What's it got to do with Scotland Yard? The suicide of a Cambridge man in a Cambridge church?" She gave him a shrewd look. "The deceased would seem to have been an interesting man but surely of no concern to the Metropolitan Police? What's more, I would have thought ..."
He stopped her flow of protest by putting a finger over her lips. "That'll do, Adelaide! Look -- this here isn't a case for the Cambridge CID, I'm afraid. You'll have to take my word on it. I'll do the necessary for now but this is Joe's man." The surprising presence of a man investigating in Cambridge for Joe Sandilands connects with Joe's extended responsibilities of liaison with the Special Branch, whose members Joe has described as "Twenty-six languages among them, guns in their armpits and fists like steam hammers. I try not to annoy them!" To sort out this death and its importance to a dangerously international scientific laboratory in Cambridge (think German scientists, and more), Joe will need to immerse himself in the lives of the very wealthy and very prone to hurt and humiliate -- with high risks to all in his network. Adelaide herself has already seen too much and is in danger. So, for that matter, is England. Espionage, crime, loyalty, and betrayal make this one of the more intense Joe Sandlilands investigations. Each twist -- and there are plenty -- is well outlined and intense, and the book accelerates in pace toward a dangerous confrontation, a revelation of secrets and pain, and two of the more grievous losses that Joe will ever witness. A highly recommended book, and newly released from Soho Crime. 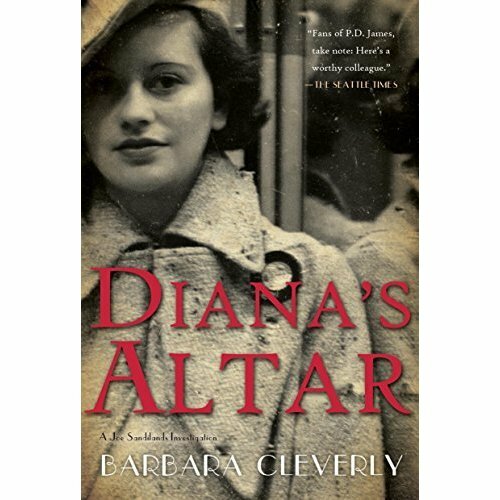 By the way, Cambridge is home turf to author Barbara Cleverly, and her mastery of this crucial period in British history is laid powerfully against her meticulously portrayed university town. 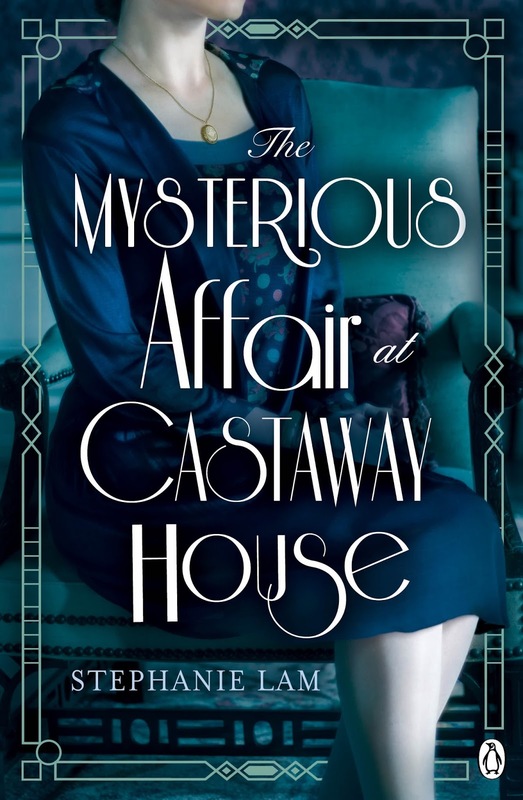 The US publication of Stephanie Lam's debut novel, a modern-day Gothic set on the coast of England, is a perfect excuse to curl up on the couch with a cup of tea (or cocoa) and slip into another world -- one where mystery, desire, and suspense mingle, enhanced by startling moments of joy and discovery. 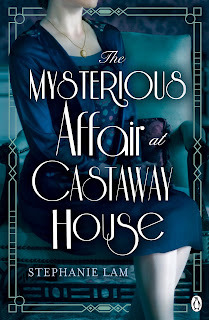 Like the instant of revelation of a flash of lightning, THE MYSTERIOUS AFFAIR AT CASTAWAY HOUSE opens through the eyes of a small girl in a dirty dress, overwhelmed with longing for the grand house up above the cliffs of the British seacoast. But the storm quickly moves forward, placing us at the dark and very grubby entrance to the once-grand home as of 1965, as 18-year-old Rosie Churchill struggles to find rent for her first home away from home ... as a boarder in this peculiar rooming house. She's not that far away geographically from the home where she grew up, and her mother keeps trying to reach her by phone. But Rosie's got her reasons for running away. Quite a few chapters will pass in this satisfyingly chunky book (500 pages! ), with its pulsing narrative that flips madly from 1965 to 1924 and back again, before Rosie gets specific about those reasons. The damage to this teen, though, opens her to a number of compassionate actions toward the old tramp arriving at Castaway House, insisting he's stayed there before. He squeezed my hand. 'Life-threatening,' he growled. Rosie's secrets, Robert's secrets -- and it's Castaway House (and the tramp Dockie) who will tie them together. Shelve this one next to Laurie R. King's dark British exhumations of the Sherlock Holmes "continuation" or the archaeological mysteries of fellow Brit Elly Griffiths; there's a tang of English despair that also echoes into the Charles Todd series. And underneath, of course, the dire precedent of Jane Eyre. Storm, grand house, secrets -- oh yes, leave room on that bookshelf. This is Stephanie Lam's debut, and it's clear she'll have more good mysteries to follow. Website here; the book is published by Penguin and distributed via Trafalgar Square Publishing. Maine native Mike Bond brought out his second "superthriller" in July 2015, KILLING MAINE. 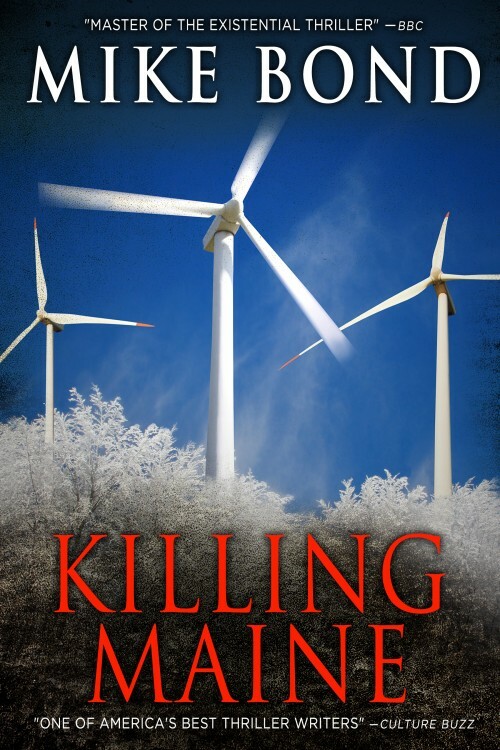 The book's premise is that wind power has not only devastated the wildlife and scenic peaks of the northern New England state -- the big money involved in it has corrupted at least half of Maine's legislature. But Hawaiian/Maine Special Forces veteran Pono (Sam) Hawkins gets a call to rescue a former SF comrade from a frame-up during Maine's winter of discontent, and with the help of three women who want his body, Pono launches into the legal and legislative and bullet-riddled fray. 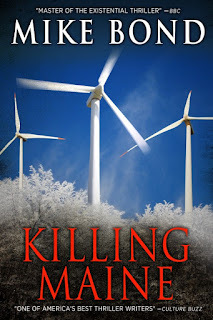 KILLING MAINE recently won the New England Book Festival First Prize for Fiction, which is why the book is getting fresh attention this spring; the climate crisis and alternate energy aspects are fictionalized as extreme and terrifying, which turns out to support a fast-paced page-turner. Congrats to the author and his team -- and to the publisher, Mandevilla Press, which consists of Mike Bond and Wess Roberts.